paperback, with flaps and end-paper maps, 9-1/2" x 9-7/8"
Cover: Stand, c.1760-80, L 48.3 cm. Overglaze enamels, first-class export, possibly unique. Private collection. The superb porcelains exported from China tell a fascinating story of evolving tastes and traditions in the New World. Written by a leading authority, this book illustrates more than 250 objects in full color and provides guidelines for understanding and evaluating them. It includes appendices on major shipwrecks and archaeological sites, a discussion of marks and gilt wares, a glossary, notes and a bibliography. This is an unabridged reprint of the clothbound edition published by Clarkson N. Potter in 1986. "The most beautiful vessels and plates of porcelain that one can describe are made...in this city. And there is plenty there and a great sale, so great that for one Venetian groat you would actually have three bowls so beautiful that none would know how to devise them better." So wrote Marco Polo of the chinawares he observed in his thirteenth-century travels in China's Fukien province. Since that time our appreciation of and appetite for the superb porcelains exported from China have, if anything, increased. Spectacularly varied, from charmingly naive to delicately ornate, export ware is a unique symbol of East-West relations. The study of these objects and the history of the porcelain trade in North America tell a fascinating story of evolving tastes and traditions in the New World. 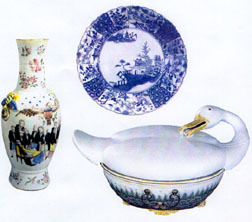 Historian and art scholar Jean McClure Mudge, whose previous work on porcelain is a standard reference work on the subject, is one of the country's leading authorities on Chinese Export Porcelain. Now in Chinese Export Porcelain in North America she offers an even greater collection of porcelain objects, more than 250 of them in full color and many never before photographed. The entire range - from the earliest pieces carried by Spanish, Dutch, French, and English ships to the newly founded Colonies, the post-Revolutionary commission work, and lesser known discoveries from excavations and private collections in Mexico - is represented. Dr. Mudge traces the influences of colonial powers on porcelain decorations and forms, providing useful guidelines for understanding and evaluating these highly collectible objects. Drawing on numerous sources previously unexplored in book form, including several from the People's Republic of China, the comprehensive text includes appendices on major shipwrecks and archaeological sites, a discussion of marks and gilt wares, and a helpful glossary of porcelain terminology. Chinese Export Porcelain is an indispensable source of information for any collector and an invaluable addition to the library of every curator, art historian, or archaeologist. 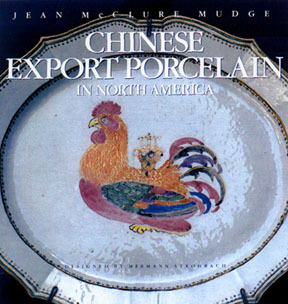 Jean McClure Mudge is a documentary filmmaker and author with a long-standing interest in Chinese porcelains. She holds a master's degree in Early American Studies from the University of Delaware, where she was a fellow of the Henry F. duPont Winterthur Museum, and a doctorate from Yale University. She is a past curator-in-residence of the Emily Dickinson Homestead in Amherst, Massachusetts, and lectures often on the subject of porcelains.